The YMCA of the Prairie needed a way to inform its nearly 8,000 members (in three rural communities) about its upcoming programs. KRJPR created an eight-page program guide that is mailed to members. Its small size (5.5 x 8.8) is convenient for mailboxes and for members to keep posted on their refrigerators to help them remember to sign up for programs. 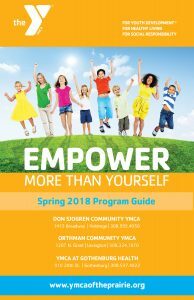 Download a recent YMCA program guide sample. If you’d like to start a project with KRJPR, please give us a call at (308) 995-5561 or email Kristine Jacobson at krjacobson@q.com. KRJPR is a participant in the Amazon Services Associates Program, an affiliate advertising program designed to provide a means for us to earn a small fee by linking to Amazon.com. Do you have a story you want to share? Tell us all about it by filling out our contact form. Or, give us a call today!